For a healthier twist on a holiday classic favorite, try this easy recipe for a Cheesy Green Bean Casserole that is creamy, cheesy, made with Greek yogurt and without soup. Thank you to Del Monte (through their partnership with POPSUGAR Select) for sponsoring this post! Caprese Chicken Quinoa Bake is a healthy, protein-packed quinoa casserole bursting with fresh tomatoes and basil. Inspired by the popular Caprese salad, this easy to make bake will become an instant family favorite! Thanks to Omaha Steaks for sponsoring this post and providing the tasty chicken used in this recipe! Back when I was working outside the home, I brought my lunch every day. I usually brought a peanut butter sandwich, pizza or leftovers from dinner the previous night. Occasionally I brought an organic microwavable meal. While not an ideal option, I could prounounce all of the ingredients, it was quick and convenient. It was also pretty tasty too. 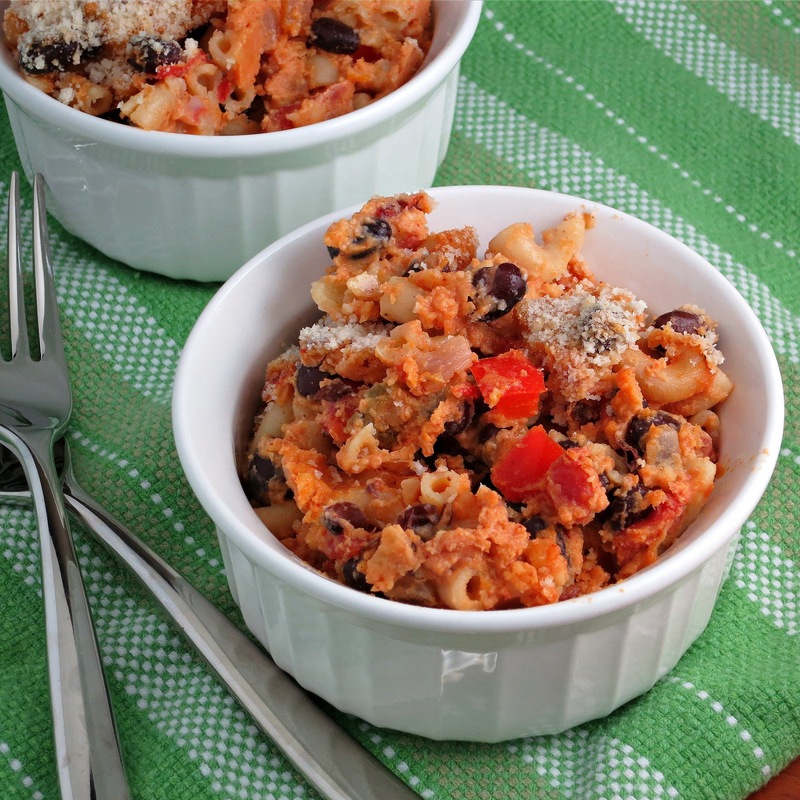 One of my more recent favorites was Black Bean Tortilla Casserole. I don’t have much of a need for microwaveable meals these days now that I stay at home with Adam. So when I saw a recipe for Mushroom and Black Bean Tortilla Casserole, I was pretty excited to recreate the convenience food I enjoyed and make it a healthier option. The original recipe looked like it could use a little sprucing up, so I added spinach, onion, used more garlic and changed up the spices. I love the additional vegetables in this dish. It’s a lighter and healthier option, and is also quick and easy to prepare. Leftovers reheat nicely…which I guess sort of makes it a microwavable meal, only better! Preheat oven to 400 degrees. Spray 2-quart baking dish with cooking spray. Set aside. In a large skillet, heat oil over medium-high heat. Add onions and mushrooms and cook, stirring often, until browned (about 7 minutes). Reduce heat to medium and add garlic and chili powder, stir for 1 minute. Add black beans and spinach and stir to combine. Cook until beans are warmed through (about 2 minutes). Remove from heat. Arrange 5 tortilla halves in baking dish. Top with half of the bean mixture and 1/2 cup salsa, then sprinkle with 1/3 of the cheese. Repeat with another layer of bean mixture, salsa and cheese. Top with remaining tortilla halves, salsa and cheese. Cover with foil and bake 10 minutes or until center is hot and cheese melts. Uncover and bake until cheese is bubbling, 5 minutes OR if your dish is broiler-safe, put under the broiler until cheese is bubbling and browned.